“This is harsh, rugged Roussillon country where the weather ranges from searingly hot sunshine to bitterly cold with violent winds (the Tramontane, which blows off the Pyrenées). Phillipe Gard produces wines from both appellations at his Coume del Mas winery, and his examples shine out with their purity and honesty.” Well, just a few years on and Andy has settled into life in Collioure, marrying his Scottish fiancé, having their first baby, and finding a job as assistant winemaker at Coume del Mas, working alongside owner and winemaker Phillipe Gard (right) on his 12 hectares of vineyard. Andy also makes his own range of wines under the Cook Wines label, and has a negociant business with Phillipe Gard called Tramontane Wines. Coume del Mas farms near-organically, and work in the vineyard is done by hand, or with ploughing with horses where the terrain allows. Not long ago Andy and Phillipe came to Scotland to show their wines in a dinner at the terrific Seafood restaurant in the seaside village of St Monans, not far from St Andrews. Various Coume del Mas wines were shown, some of which are available from Luvians Bottle Shops in St Andrews and Coupar. Andy also gave me a preview of his new ’boutique’ label Consolation, which is joining his own Cook Wines range. See all UK stockists of Coume de Mas wines on wine-searcher. 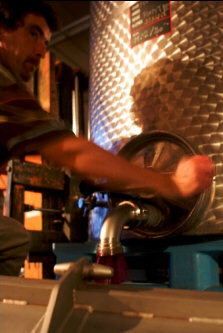 Grenache Gris, fermented with wild yeasts in barrel and stays in barrel for seven months. Nice nose hinting at grilled toast, but with orange and a little touch of ripe, peachy character. The palate has fine mineral acidity. Dry, but the fruit is lovely, with a certain richness to the texture and then the acidity kicks in. Very fine. 90/100. This was a sneak preview of one of Andy’s own Cook Wines range, Rich, ripe, pear nose, masses of smoky, fragrant honey. The palate has weight and a decisive sweet and sour character. The smoky, creamy oak is powerful but the core of acidity is there. Fantastically decisive finish. 90/100. Grenache from vineyards never more than 100 metres from the sea. Unoaked. Very tight, focused, peppery, spicy black fruit with touches of liquorice and a lovely background of schisty, mineral character. The palate is similarly tight, the glossy, pure black fruit has laser-guided focus and the spicy, tight tannins are supple but chewily dense. Lovely balanced acidity too and really very fine energy. 92/100. A lovely, deep, fragrant, cedar and woodsmoke nose, with a touch of black olive and pepper and plenty of spice. There’s a cool, pure black fruit at the core of this. On the palate there’s more of the savoury quality of olive and balsamic notes, but the tight, schisty mineral quality comes through. Very fine tannins and a juiciness which is lovely. This has wonderful focus again. 92/100. A barrel-aged wine, of which only two barrels are produced. Fresh, pear and melon aromas, touch of marzipan and quite rich. On the palate it has quite delicate pear fruit, nice delicate sweetness too – medium-sweet but matched beautifully with foie gras; good acidity to balance. 88/100. Harvested with 17.5% potential alcohol and the ferment stopped with 80g/l sugar remaining, this is aged in 50% new oak, in a totally reductive, modern style with the barrels topped up to keep them full. Deep, dark, tight chocolaty character, with kirsch-like, tight and floral notes of violet. The palate has beautiful fruit, with a deep, sensuous pool of chocolaty black fruit, but this retains fantastic energy and vibrancy, shimmering with tight, fine tannins and superb acidity. Long and tantalising stuff. 93/100. Another sneak preview of Andy’s Consolation project, this is very tight, very cool with an underlying sense of chocolaty density. Stays beautifully focused, has lots of energy despite the ripeness and hint of sweetness with tight, ripe tannins. 90/100. From a stash of old Rivesaltes discovered by Andy. Aged in Armagnac barrels. Gorgeous nose – leafy tea, butterscotch and toffee, with a lovely edge of grapefruit. That palate has delightful poise and balance. The vanilla and smoke comes through, but this has gorgeous orangey fruit. Very pure. Nutty and yet carrying the oxidation lightly. 92/100. See all UK stockists of Coume de Mas on wine-searcher.